Prof John Miles said the city’s narrow streets would make a conventional tram system impossible – so a radical solution was needed to cut congestion. He said Britain was a world leader in “boring small tunnels”. Prof Miles, from the University of Cambridge’s engineering department, told the BBC’s Sunday Politics East programme that advances in vehicle technology made the CAM affordable. “We have autonomous and electric vehicles so we can propose a trackless tram – we don’t have to have rails in the ground or any overhead power cables,” he said. 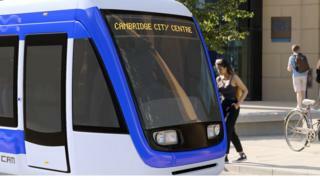 “We need to utilise the existing infrastructure instead of laying more tarmac,” said Chris Rand of Smarter Cambridge Transport.